Perhaps like many other physicians, Frances Kirkland Lawhead found herself drawn toward medicine at an early age. She enjoyed accompanying her father, otolaryngologist Dr. Ron Kirkland of Jackson, Tennessee, on hospital rounds, often spinning around in the chairs at the nurses' station. "The medical staff was always kind to me, and dad knew everyone and spoke jovially as we walked through the halls," Dr. Lawhead recalled. "It was neat watching him as I was growing up not only as my father but as a great doctor. I was drawn to science and math, and I ended up following his footsteps, going to med school and loved it. It was a great fit." As if hospital rounds and a friendly staff weren't enough, there was her father's unique homework project. "We still laugh about his preserving ears - yes, human ears - in our refrigerator at home for a research project he was conducting," she said. "We've enjoyed discussing medicine over the years and even sharing a few patients prior to his retirement." 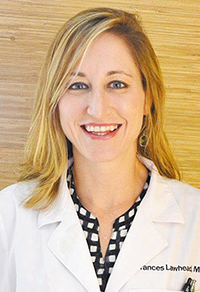 Today, Dr. Lawhead is a dermatologist at the Memphis Dermatology Clinic on Union, where she specializes in Mohs surgery and cutaneous oncology. Mohs surgery, named for Wisconsin physician Dr. Frederich Mohs in the 1930s and since refined many times, is used to treat cancerous lesions, growths and tumors of the skin. The surgery also treats local skin cancers such as basal cell carcinoma and squamous cell carcinoma. The surgeon removes skin tissue one layer at a time, examines the tissue under a microscope and continues until the final layer is free of cancerous cells. The Mohs procedure minimizes damage to healthy skin and reduces the size of scarring, which is important when dealing with areas such as the face, ears and neck. "I thought OB-GYN would be my path in medical school but decided during the clerkship that it wasn't for me," Dr. Lawhead said. "Then I rotated with Dr. (Rex) Amonette at his office, where I now work, and fell in love with dermatology. I am truly grateful to practice at Memphis Dermatology Clinic alongside extremely bright, talented, caring physicians and a superb staff." With all of its outdoor attractions, Memphis also has the accompanying downside: lots of sun. People don't always wear a hat and protective clothing, don't avoid peak sunshine hours, or don't coat themselves with sunscreen with at least a 45 SPF (skin protection factor). "We see so many patients who've been exposed to the sun for many, many years for work or pleasure, such as playing tennis or running," Dr. Lawhead said. "That's one of the draws of Memphis. You want to live your life and enjoy yourself, but you've got to be smart about it." Dr. Lawhead comes from a family that is loyal to the University of Tennessee and all of its institutions throughout the state, including Knoxville, Martin and Memphis. There have been nearly two dozen UT graduations involving her parents, her three brothers, herself and husband Jake, a Memphis realtor. She jokingly worried that she might be disowned when she accepted a fellowship in Mohs micrographic surgery and cutaneous oncology at the University of Florida in Gainesville, which she completed in 2011. "We love the University of Tennessee," she said. "Medical school was a special time. Sometimes it was hard seeing my friends having a more enjoyable lifestyle, but the things we learned to do and opportunity to practice medicine is incredible. There are a lot of benefits to having worked hard." She and other doctors at the clinic work with medical students and residents, and Dr. Lawhead currently is helping a high school student with a dermatology project this summer. "Part of medicine, in my opinion, is giving back in some way, and that's one way we do it," she said. "My focus is mostly on detecting and treating skin cancer. Technology seems to change day by day, and we've got to use it to help patients as best we can. It's really neat to have a patient come in with skin cancer and to leave without it." Dr. Lawhead and her husband are the parents of two active daughters, Sadie, 6, and Iris, 5, but she still manages to work in some time for tennis and running. She has run the Boston Marathon twice - once in 2008 and again nine years later when, with a time of 3:35:38, she shaved nearly a half-hour off her previous finish. "I've yet to run a great Boston Marathon," said Dr. Lawhead, a multi-sport high school athlete at the University School of Jackson. "My best marathon was in my hometown at 3:16:44. You have to manage multiple aspects during marathon preparation, including training schedules, hydration and nutrition. "We rarely sit down at our Mohs surgery practice during the day, and I think being physically fit helps with some of those challenges. Running also lowers my stress, and it's a fun activity." And she never forgets the sunscreen.